We were absolutely all over them in the second half - with a bit of luck (and better finishing) it could have been five nil. However if we get in the play offs we have no chance without Craig Stanley. Very unlucky not to win today, better team in the first half and completely dominant in the second. 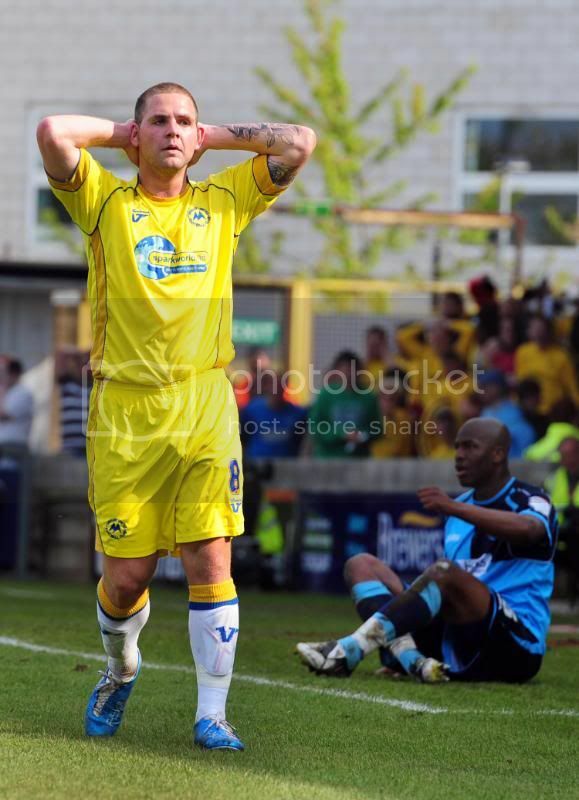 If Wycombe do end up in the play offs then they won't want to play us! The formation was better with Eunan on the right wing and Zebs/Tomlin up front. Much of our good play came from the right with Robinson drifting in and out of the game at times although a volley in the first half would have been goal of the season if it had gone in. He was also unlucky not to score in the second half cutting inside and unleashing a shot that just went the wrong side of the near post! Zebs and Tomlin both had half chances in the first half but it was kicking towards the Ellacombe End where a series of near misses and saves denied us victory. Branston could have scored twice from corners. The first early in the half where his header hit the base of the near post and the second where Bull pulled off a reaction save to keep it out. Kee had an one on one though from a tight angle and his shot went agonising wide of the near post. Murray had a glancing header from a Nicholson free kick which went off the bar. O'Kane tried a lob from near the half way line after Bull cleared from outside his area under pressure but it was under hit and he was able to get back and catch it. Amazingly there were other chances with shots from Kee, Stanley and O'Kane going wide / over or being blocked which gives an indication of the pressure Wycombe were under. At the other end, Nicholson had to make a clearance header and Bevan / Rendle both went for and missed an inviting cross but it was mainly one way traffic. As for Wycombe, they had a big defensive unit but maybe because of the pressure they were under didn't threaten often and had to resort to fouling. Bull as usual, came up with some good saves and kept them in it but even he spent much of the second half looking relieved and counting his good fortune. What a cracking game of football under a delightful Torbay Sun ;D Nice to see the usual suspects in the usual places. Scott Rendell got a reasonable welcome and lined up with a good side and a giant (Winfield) at number 5, Ainsworth the peg seller at 7 and Betsy at 11. Decent bench as well. Nice to welcome Stanley back - when we get to the play off's he will be missed. Not sure what the formation was but looked 4 - 4 - 2! We seemed not to want to spray the ball from the right to left when Robinson was free but chose theleft which was broken up well by the Wanders number 6. Was it a good penalty shout in the first half - looked like their player scooped it up? The second half started with a bang with Branston hitting the post within a few minutes of the restart. Nicky Bull (remember him?) pulled off a fantastic save from Branston. We whould have been at least 2 nil up at this stage. Tomlin had a good chance and wasted it, then Robinson cut in well and flashed a 30 yarder just past Bulls right hand post. Billy Kee had the chance to wrap up the three points (would have fancied Tomlins chances better with this chance) but put his chance inches wide into the side netting. Cue hands round heads. Ronan then glanced one against the bar and it was obvious by then that we wouldn't score. With this point goes our automatic play off chances and meant that Chesterfield were promoted. Well done to them. I thought we were pretty good yesterday - wouldn't go as far as some other reports I have read and heard on the radio, but it is very true that with more composed finishing we could have been clear. This is very impressive considering we were playing a team who have been in the automatic places all season. Particularly in the second half we dominated and created some very good chances........and then panicked. We looked pretty nervy in the final third from the off and should have scored at least three. 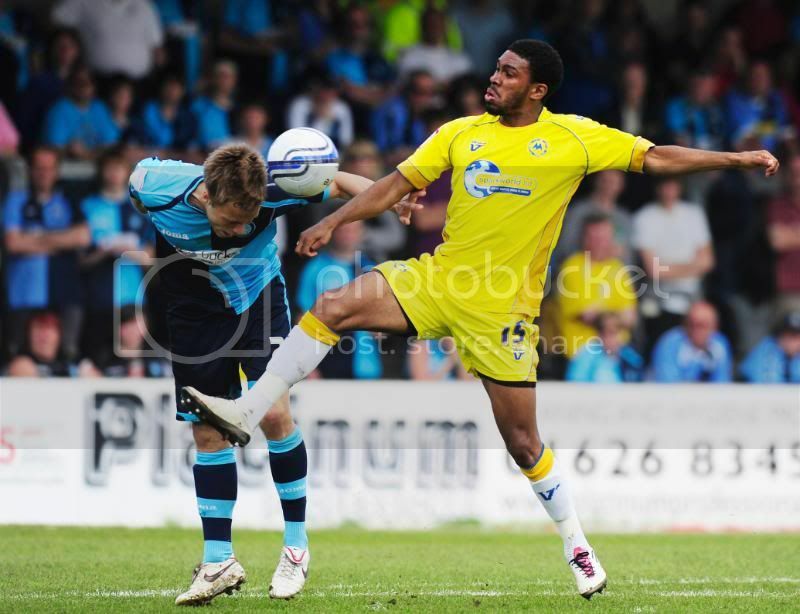 That said Wycombe are a decent side and awlays posed a threat on the breakaway. I also found it strange that the pitch was so heavily watered immediately prior to each half. Zebs looked like bambi on ice early on. I have not previously been too impressed with Tomlin, but yesterday was by far his best game for us - he held the ball up well and brought others into the game with some neat touches. He turned very nicely in the box in the first half and then blazed a shot just over. There were plenty of other postives all over the park. Branston's was pretty much the most dominant performance from a centre back I have seen in a long time. He also was very unlucky not to score with a couple of great headers. The defence in general played well - there was a pretty even battle between Nicho and Ainsworth - a player I have always rated and Mansell did well against Betsy. 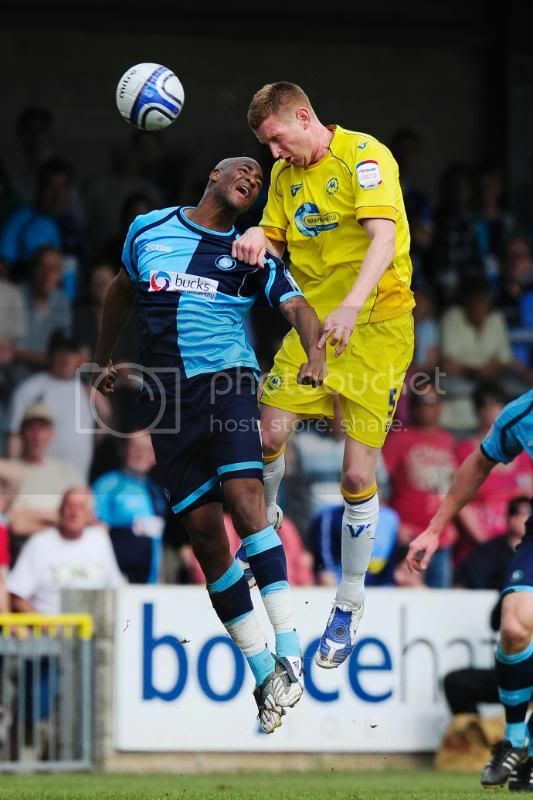 I was a little concerned at the space we allowed Wycombe to come at us. Whilst Stanley was superb, we looked a little too open. Personally, I prefer Oastler to Lanthorpe. When Murray's header came off the underside of the bar you knew it was not going to be our day - Wycombe looked more likely to nick it as we entered the added three minutes. Hopefully the luck that has deserted us in front of goal in recent games will turn in the next three matches. Stevenage's loss ensures that whatever happens in the matches today we will be in a play off position at kick off on Monday. Burton will certainly be tricky - we at Torquay United know how a team at the bottom will defy their league postion in these type of matches. However, if we can sneak a win it will be a massive result given the other games that are taking place on Monday - Stevenage v Port Vale, Shrewsbuty v Accy and Rotherham v Gillingham. Some massive games - We are the only team in the top eleven not to be playing each other. Time to make it count. Mathmatically we can still get automatic promotion! I think it's only Wycombe we can catch now so they would have to lose all their remaining games...which aint gonna happen! Do we want to go up in third though? Somebody mentioned that the money a club receives for said position is £5.000! Which to be honest...is crap! I know that the play-offs are a complete lottey, but, the financial gains are enormous. Our home game will be sold out and televised. The away leg will be televised. The final will be a share of the gate money and that match will be televised also! That lot must come to a quater of a million...surely! So all we have to do is continue to play as we are~Stanley is going to be a huge loss though~and it's simples! Register - I think you are wrong about Wycombe having to lose all their remaining matches for us to catch them. We are on 66 points with 3 to play so we can achieve 75 points. Wycombe are on 71 and an inferior goal difference so they could even win and draw a game and still be pipped by us. They have a tough game at Bury. Of course, this ignores Shrewsbury who have 69 points and 4 games to play. Their run in looks easier starting at Hereford today and I think they will clinch the 3rd automatic spot leaving the prospect of us facing Wycombe again in the play-offs which wouldn't worry me from what I have seen so far. I do agree that the play-off route would bring a significant financial advantage but not counting chickens or pound notes just yet. Interesting stuff Register and Ricardo. For any chance of automatic surely we need to win all three? Shrewsbury need to take only six out of their last twelve points for us to end above them on goal difference (hopefully). Half time today they are winning 1-0 at Hereford. Any way, this ramble contains no gurantees! To those making the trip - BE LOUD! I was having breakfast at a cafe opposite the market in Totnes at 8.20am . So having time to spare later in the morning nothing changes in 50 years as I walk onto the steps on Abbey Sands that it starts to pour with rain. Quite refreshing as we have had no rain for at least 6 weeks, & only two days since the New Year here in the S.East. Nothing really to add to the match reports as we practically dominated the game, Wycombe over the 90 mins were going to get chances & Branston was tremendous against Rendell as we never like to see an 'old boy' returning & doing well. We had really good chances to score & would have put my house on Billy K. putting us ahead as he was fed in by Stanley but crashed it wide. He doesn't appear comfortable on that right side but I felt we lost the edge in midfield when Lanthorpe was taken off to accomodate Billy in order to force a goal. With Gillingham, Port Vale & Stevenage faltering a point forwards in the right direction and onwards to Burton on Monday. to much mirth & merryment. If true. How sick in the head are you when you make such remarks to no matter who it is? It's still just some silly game called football and it's supposed to be for leisure. And it surely shouldn't be used to sprout this kind of language. Shame on that person who made the remarks. I hope the club can take action against this person / these people, dissociate from it and offer an apology to Scott.